Needless to say, this did not have quite the same intensity as the game 24 hours prior. The scoreboard read 5-1 at the end, and it was the Americans who came out on top versus Slovenia and finished out their group play with a bang. 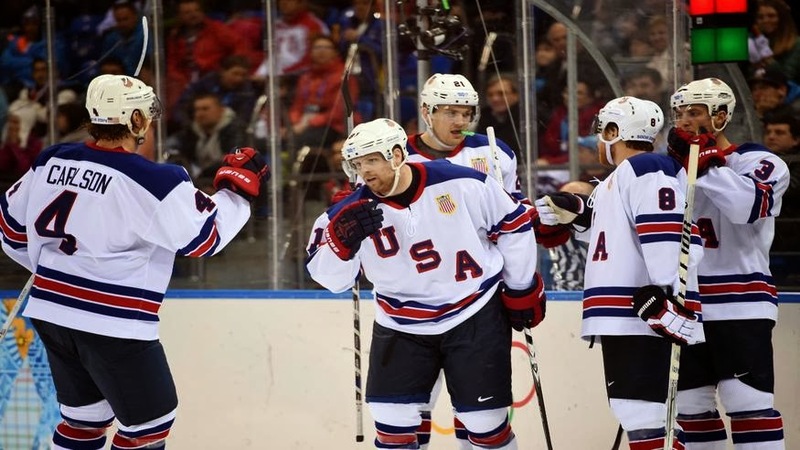 Ryan Miller provided the muscle in net, stopping 17 of 18 shots, and Phil Kessel dealt his first-career Olympic hat-trick, providing the scoring-punch the Americans needed to dispatch of the Olympic newcomers rather easily. Ryan Miller stepped in for Jonathan Quick, stopping 17 of 18 shots and reminding people that he can still play on the world-stage. It was nice to see Miller get another taste of Olympic action and give Quick a breather, as coach Dan Blysma will certainly go back to Quick for the upcoming knockout rounds. Coupled with the fact this will most likely be Miller's last go-round with the national team, its good to see him go out (in a way) on top. Kessel and the Americans wasted little time in grabbing the lead, scoring just 1:04 into the game. Kessel pulled the moves on poor Mitja Robar, who got crossed-up big time by the slick move, opening the lane for Phillip to beat goalie Luka Gracnar. Kessel added his second on the day three minutes later, and completed his hat-trick at 11:05 of the second period. Its the first Olympic hat-trick for an American in 12 years, the last coming from John Leclair in Salt Lake City in 2002. Ryan McDonagh made it 4-0 a minute later at 12:17, and David Backes put the icing on the cake at 3:26 in the third period. Slovenia's Marcel Rodman did get one back for his country way late in the game, at 19:42 to be exact. The score ended the shutout-bid for Ryan Miller, who was making his first Olympic start since the 2010 Gold medal game in Vancouver. So with the group stage complete, the quarterfinal bracket is set, and forecasting just a little bit, and barring any major, major upsets, it would seem that the U.S.A. and Canada are riding the rails to a collision course in the semifinals. The U.S. awaits the winner of the Czech Republic and Slovakia, while Canada will play who ever comes out of Switzerland and Latvia smelling like roses. The other side of the bracket will see Slovenia and Austria duking it out for the right to lose to Sweden, and the other half seeing Finland playing the winner of Russia and Norway. You can see a visual of the bracket here. The host nation should have no problem dispatching Norway, but the fact that Russia has to play in the extra game surely does not sit well with the fans across the country who demand the Gold medal to be delivered. I'm sure they consider it a dishonor to play in the qualification game. And as another tidbit to keep in mind, the bracket sets up, which is even MORE down the road, of a potential Russia/U.S.A. Gold medal game. Imagine the scene if things were to break that way. But that's much too far away to seriously consider right now. For the time being, the Americans can enjoy the few days off while the other teams battle to the death to stay in the tournament. They've certainly earned it, and their play has been some of the best in the three games played thus far. It'll either be David Krejci and the Czech's or Zdeno Chara and the Slovaks in the first knockout game for Team U.S.A. I'm all for Bruins players having international success, but when the rubber meets the road, I'm going all out for the Stars and Stripes. U-S-A! U-S-A! U-S-A!